What Size is Your Problem? 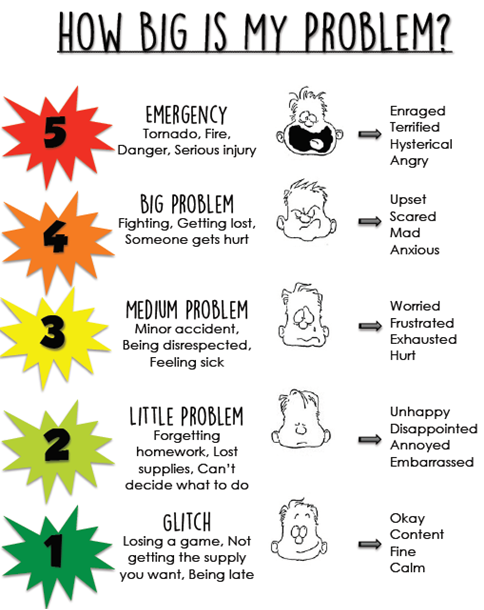 In continuing with teaching emotional regulation, we incorporate a tool called Size of the Problem in our lessons. This tool not only helps with guiding children with problem solving but in recognizing the appropriate or expected size of their reaction. We teach that not all problems come in the same size. We have glitches that we can solve all on our own, little problems that may involve another person, medium problems that involve 5 or more people, big problems that affect 10 or more and then huge/emergency problems that are considered emergencies. In teaching size of the problem and reaction, we empower children by validating their feelings and giving them perspective taking skills. We increase their emotional intelligence by teaching them vocabulary for their emotions and also help them understand logic and reason. Even though some glitches feel like emergencies, if we react to all problems as if they are an emergency we will never get anything accomplished. The goal is to teach children to put their feelings into perspective, so that they them become available for problem solving. We may not be able to change our feelings but we can help our students understand how to control the size of their reactions. Now remember, this takes lots of practice and time to master, but the carryover of language used at school to home will reinforce the lesson!